← What Does the Bible Say About the Reasons for Disasters like Hurricanes Harvey and Irma? Most of the great creedal and confessional formulations of the church have been composed in response to widespread error or heresy within the body of Christ and while there are many different errors and heresies that are currently dividing the church, some of the most destructive are the ones that concern human sexuality. In particular, many in the church today have embraced a form of declension that tolerates or even celebrates destructive sexual sins such as fornication, homosexuality, and transgenderism. While this kind of error in the church is serious and extremely destructive, it is by no means new. In his first letter to the Corinthians Paul spent what would eventually become an entire chapter (1 Cor. 5) of his epistle admonishing the Corinthians for allowing a member of their church to sleep with his stepmother. Instead of rebuking the offender, and practicing church discipline, the Corinthian Christians were actually celebrating how gracious they were being towards this man in tolerating his offense. Paul warned that by adopting this practice they would simply encourage more sexual sin, and bring down the Lord’s judgement upon themselves. What was needed was not more patting themselves on the back for how tolerant they were, but discipline and excommunication. They were told that they should not have fellowship with anyone who called themselves a brother – not even eating with them – who practiced sexual immorality. Our session has adopted the statement as our own statement on the subject of human sexuality and over the next 15 weeks I will be preaching on each of the articles and comparing it to the teaching of scripture. 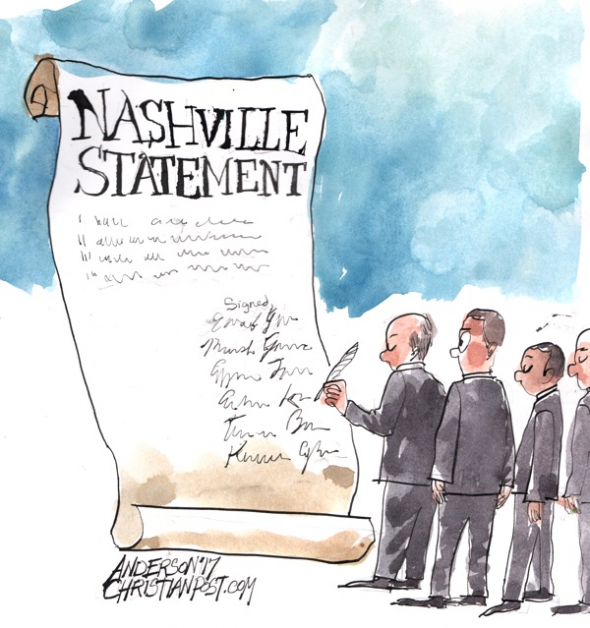 As I said in my first sermon on the subject, the Nashville Statement, in common with all merely human confessions, is far from perfect, but it is also an excellent start at dealing with the flood of heretical and erroneous beliefs that will inevitably end up drowning the church in the 21st century if left unchecked. This entry was posted in Church Discipline, Compromise, Homosexual Marriage, Homosexuality, Liberalism, Spiritual Declension and tagged CBMW, Christianity, Church Discipline, Confessions, Creeds, Error, Fayetteville, Heresy, Homosexuality, Nashville Statement, PCA, transgenderism. Bookmark the permalink.